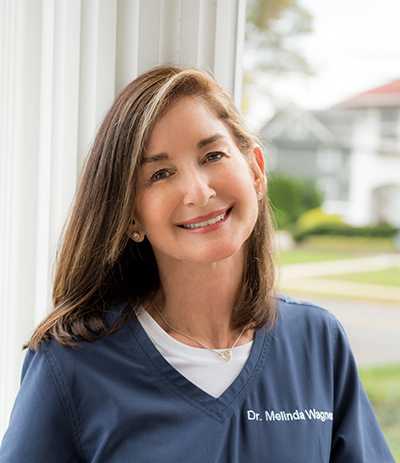 Dr. Melinda Wagner brings to Red Bank and the surrounding communities three decades of dental practice experience. Her general dentistry practice includes cosmetic dentistry, restoration of implants, pediatric dentistry, and periodontal treatment with an onsite periodontist, Dr. Rebecca Subin. Her practice employs a multidisciplinary approach to ensure that her patients achieve the best possible dental outcomes. As a result, her patients enjoy not only the personal touch of small practice dentistry, but also, when appropriate, the specialized expertise of other health care professionals. For example, some of her patients have benefitted by appliance therapy, behavior modification, and other in-office physical therapy treatment. Temporomandibular joint dysfunction (TMJ/TMD) is one of Dr. Wagner’s areas of expertise. She studied this challenging subject at Rutgers School of Dental Medicine, and over the years, has developed a recognized expertise in this area, even authoring several articles in professional publications relating to TMD/TMJ diagnosis and treatment. She has helped countless patients with TMJ/TMD issues, successfully resolving seemingly intractable problems including headaches, pain in and around the ear, tender jaw muscles, clicking noises in the jaw, and “locking” jaw joints. After graduating from the Fairleigh Dickinson Dental School, Dr. Wagner completed a one-year general practice residency at Monmouth Medical Center. Also, she proudly served in the New Jersey Army National Guard for six years, attaining the rank of Captain. Dr. Wagner was the first female president of the Monmouth-Ocean County Dental Society. She was recently honored for 25 years of dedicated service on the teaching staff at the Monmouth Medical Center. Her years of experience as both a teacher and a practitioner has given her a skill set of unique depth and breadth. Please call our office at 732-747-2032 to set you up with a convenient appointment, and if necessary, help with financing arrangements so your dental care is not delayed.